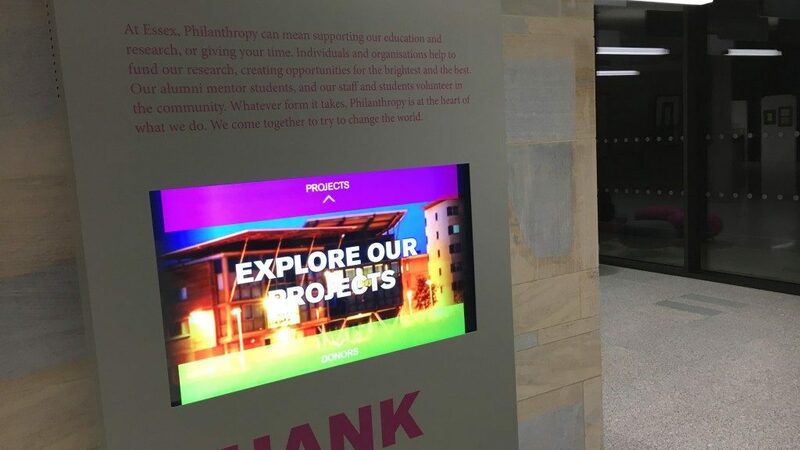 An interactive system, based on our content management system, acknowledges sponsors and donors to the university, recognising supporters and key fundraising initiatives. Visitors can explore the individual donors, including individuals, corporations and trusts and foundations, as well as the funds available and their uses. The interactive will recognise supporters of activities and initiatives including the Women of the Future Appeal, bursaries such as the Dr. Philip Hills Award for postgraduate studies in the Department of History, pioneering research, state-of-the-art campus facilities and The Essex Experience, projects which enhance the student experience. Developed around our content management system, the interactive is fully updateable by the client.